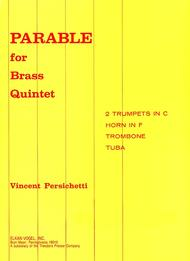 Parable for Brass Quintet (Parable II). Composed by Vincent Persichetti (1915-1987). Brass quintet. For Trumpet (in C) I, Trumpet (in C) II, Horn, Tenor, Tuba. Score and part(s). Standard notation. Opus 108. 20 pages. Duration 13 minutes. Published by Theodore Presser Company (PR.164000680).With Standard notation.